The Press Complaints Commission has upheld three of my complaints against the Daily Mail. The commission ruled that the newspaper breached The Editors’ Code of Practice on accuracy with its story about buses and planes from Romania and Bulgaria to the UK being full-up and sold-out. On New Year’s Eve last year, the Daily Mail published its story headlined, ‘Sold out! Flights and buses full as Romanians and Bulgarians head for the UK’. Their article claimed that planes and buses from Romania and Bulgaria to the UK were full-up with Romanians and Bulgarians rushing to the UK following the lifting of ‘working restrictions’ on 1 January. But following my 13 complaints against that Daily Mail feature story, the Press Complaints Commission concluded that, “the newspaper had failed to take care not to publish inaccurate or misleading information.” This, stated the PCC, was in breach of Clause 1 of their Editors’ Code of Practice regarding accuracy. The ruling is one of the last to be made by the PCC as it is closing down this week to make way for its new press regulation service called IPSO, opening on Monday. How the Daily Mail ran the story on New Year’s Eve. But it wasn’t true. Buses and planes were not sold out. Last January over 80 people, including myself, complained to the Press Complaints Commission about the Daily Mail story. 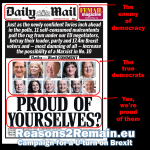 I published a series of blogs on how the Daily Mail feature story was full of serious inaccuracies and misleading statements. My blog for British Influence called, ’13 reasons why I’m taking the Daily Mail to the Press Complaints Commission’ attracted over 80,000 unique readers in a week. But at that time, the PCC decided that no ruling was necessary as the Daily Mail had published a ‘clarification’ (tucked away on an inside page). I wasn’t satisfied and insisted that the PCC investigate all the full details of my 13 complaints, compiled with the help of Alina Matis, foreign affairs editor of Gandul, one of Romania’s leading daily newspapers. Eventually, the PCC agreed. During the past seven months, the PCC has acted as go-between with statements and counter statements going back and forth between the Daily Mail’s Group Managing Editor, Alex Bannister, and myself. The investigation could only go ahead, demanded the PCC, if there was no public comment from me during the process. It’s taken all this time for the PCC to reach its decision. 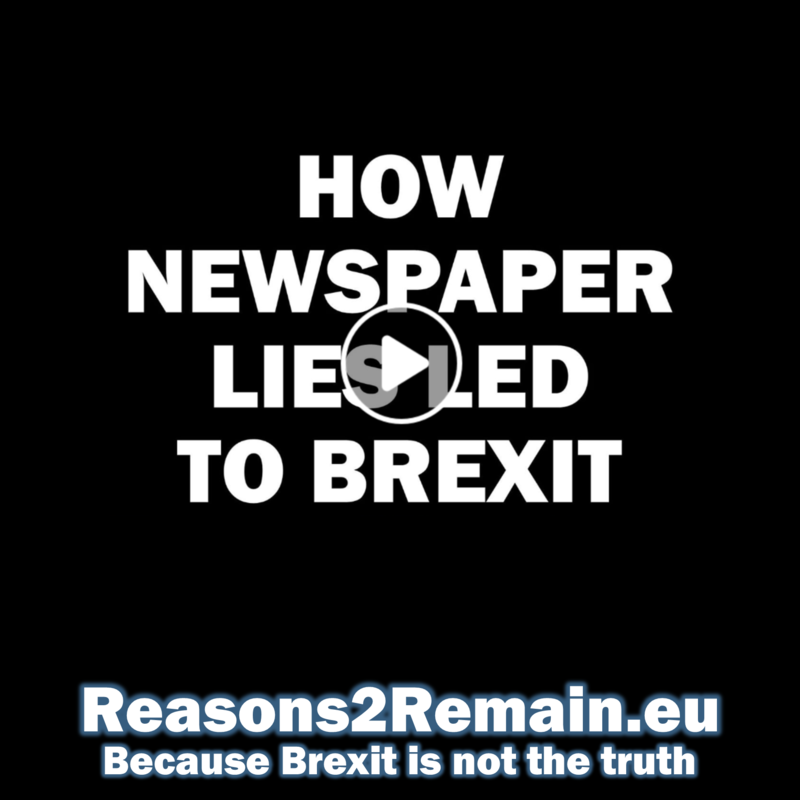 • The Daily Mail could not support its claim that Wizz Air had doubled its flights from Romania to the UK to meet “increased demand” when working restrictions in the UK were lifted in the New Year for Romanians and Bulgarians. 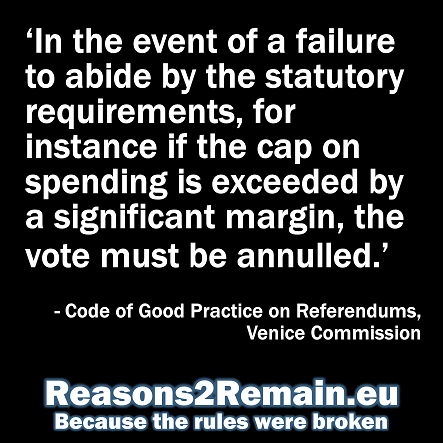 This, decided the PCC, raised a breach of Clause 1 (i) of the Editors’ Code of Practice. • The Daily Mail had misquoted the Mayor of Romania’s Dolj County, Ion Prioteasa, as saying that the numbers of passengers flying from there to the UK, “will double to 70,000 next year”. In fact, Mr Prioteasa had been talking about the total number of air passengers flying to all the airport’s destinations across Europe, and not just the UK. This, concluded the PCC, raised a breach of Clause 1 (i) of the Code. 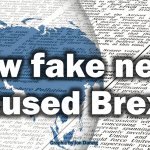 • The Daily Mail “created a misleading impression” when it reported that a Romanian woman posted on a website forum that she wanted to know what benefits she was entitled to if she had a baby in the UK. The Daily Mail article gave the impression that the woman was in Romania and wanted to come to the UK to have a baby and claim benefits. However, as I discovered, the Romanian woman had already been living and working in the UK as an NHS nurse for over two years. 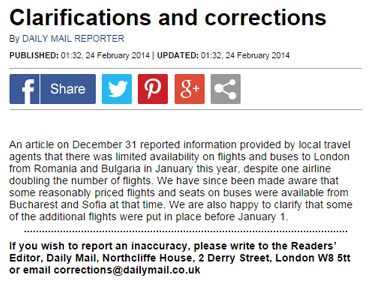 As a result of complaints, the Daily Mail had already published two ‘clarifications’ earlier this year to retract their inaccurate report that during the New Year all cheap flights from Romania and Bulgaria to the UK had sold-out and buses were full-up. However, in an apparent contravention of the PCC’s requirement, the Daily Mail’s ‘clarifications’ appeared in tiny print today under the original online article and in an obscure position on page two of the printed newspaper. I had previously rejected the Daily Mail’s clarifications as being inadequate and not clear or robust enough. My argument was that the Daily Mail’s entire story contained so many inaccuracies that it should never have been published in the first place. 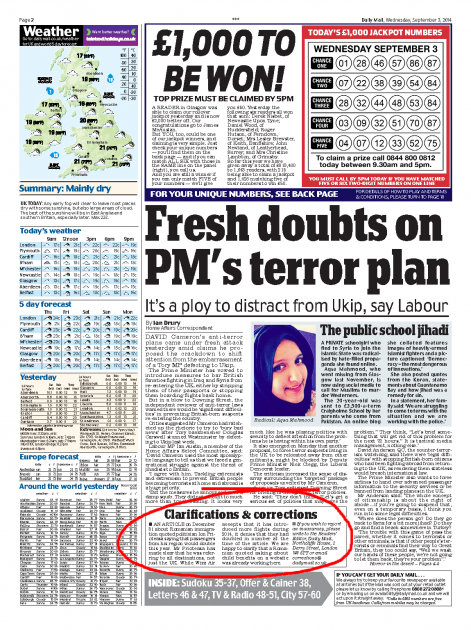 Also, the Daily Mail’s corrections, in my view, should be as prominent as the original article, which had been a leading feature story. Today’s Daily Mail printed ‘correction’: but it was hardly displayed with ‘due prominence’ as required in the ruling by The Press Complaints Commission. An earlier ‘correction’ squeezed out of the Daily Mail following the many complaints against its seriously flawed article about Romanians and Bulgarians coming to the UK. 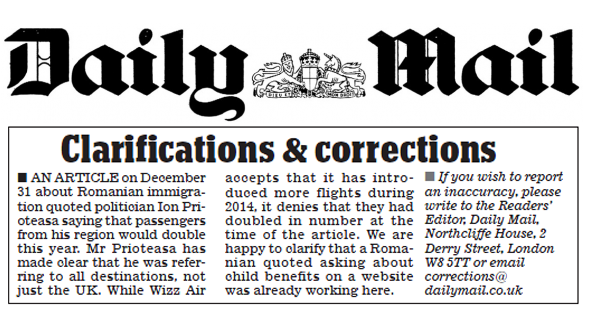 Yet another ‘correction’ the Daily Mail had to publish following the complaints against its untrue story. But the text is so small who could read it? And how many ‘corrections’ can one Daily Mail story be allowed before the entire article becomes completely discredited? Version One: The original Mail Online story published on 31 December 2013 and as it appeared until recently, claiming that flights had doubled ‘to meet demand’. Version Two: The Mail Online article as recently amended, with the removal of their sub heading claiming that flights had doubled ‘to meet demand’. The ‘new’ version claims to have been created on 30 December, a day before the original. A sneaky attempt by the Daily Mail to ‘hide’ part of its inaccurate story? • The Daily Mail story claimed that buses from Sofia, capital of Bulgaria, to London, were fully booked up, but I was easily able to book seats. The Commission did not agree that this represented inaccurate reporting by the Daily Mail. The PCC stated that the Daily Mail reporter had simply obtained different information to me, even though the information obtained by the Daily Mail turned out to be inaccurate. In a follow-up complaint to the PCC, I asserted that the Daily Mail’s inaccurate article had caused, “unjustified alarm and indignation” among its readers, and had promoted xenophobia. I argued that the Daily Mail’s “unfounded inaccurate stories against Romanians and Bulgarians generally could cause unrest in our society, unfair discrimination and dislike of Romanians and Bulgarians, and are not in the public interest”. But the Press Complaints Commission responded that their code on discrimination only allows for complaints against an individual, not against an entire race or nationality. This I felt was an unjustified and ridiculous limitation to their code covering discrimination. The Chairman of the Editors’ Code of Practice Committee is Paul Dacre, Editor of the Daily Mail. “After a battle which lasted over seven months, during which time English journalist Jon Danzig and Gândul’s reporter have repeatedly fought against a false article published by the Daily Mail on the Romanian and Bulgarian ‘invasion’, the body which overviews the British press decided that the tabloid had indeed breached the editor’s code on account of accuracy. “Jon Danzig wins his fight with the Daily Mail with a game, set and match ruling in his favour by the Press Complaints Commission.” Click to read. @HackedOffHugh @Jon_Danzig This is great, had no idea. Unbelievable that DM gets away with publishing such misleading information. 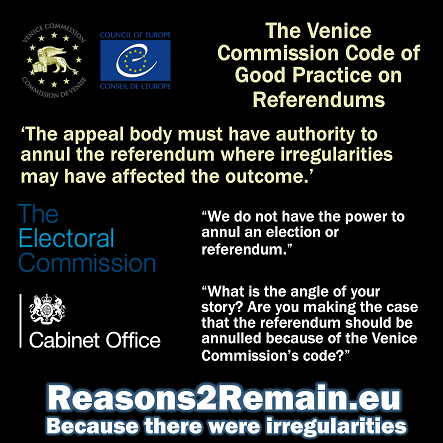 This entry was posted in Current Affairs, Democracy & Citizenship, Law & Justice, Media & Communications, Politics & Public Policy, Publications & Events, Society & Culture, The EU, Uncategorized and tagged Bucharest, Bulgarians, Daily Mail, Editor's Code, EU, European Union, free movement, immigrants, immigration, IPSO, Mail on Line, Paul Dacre, PCC, Press Complaints Commission, Romanians, Sofia, Wizz Air, xenophobia. Bookmark the permalink. Previous: A country called Europe? Next: Why did UKIP win in Clacton? This shows everything that is wrong about the failure of the newspaper sham regulator, the PCC (and it’s near clone IPSO), to ensure that newspapers like the Daily Mail do not mislead their readers. Jon Danzig is to be congratulated for his persistence in forcing the PCC to at least rule that the Daily Mail had misled its readers on multiple issues of fact and misrepresented people it quoted. But the correction that the PCC has required is tiny and in no way provides proper remedy for the lies that the Mail has been caught telling. We are so disgusted by this abuse and discrimination since last year, that we don’t even bother to react any more. The Greenslade article is very scathing, it justifies your hard work. It’s shocking that the PCC have been so half-hearted in their enforcement. If the list of cases registrated by PCC is published at the address http://www.pcc.org.uk/advanced_search.html …. why this subject could not be founded in there ? that was not a correction, but another mocking. Thank you Mr. Danzig for what you’ve done, but not all battles are worth fighting. As a Romanian I’m used to be mocked by Daily Mail. It was disturbing in the beginning, then annoying and now is just boring.I pity those so called journalists. Absolutely appalling and discussed by UK full scale racism race against Romanians as we all EU already know ( after 25 years) that romanians are one of the most hard working and smart nation !! While those pounters tried to renegade our nation name the hole EU is invaded(through UK borders) by indians, pakistany and asians but nobody rase that issue in Daily Mail!!! 70% of UK emigrants are from the countries named above: Facts! …and the GATE to Europe ! Best thing can ever happen to EU is for UK to pull out from it. Hope Farage win elections and lead UK to some nord baltic community or aliance and just f..k off from Europe as we all had enough of them !! Well done for seeing this through and proving what a corrupt and pathetic media the Daily mail is. Newspapers like this should be stripped of their license. A big thank you and keep up the good work! You could legitimately complain that they call a declaration that they outright unequivocally lied a “clarification”. A “clarification” implies that they were telling the truth and a few idiot readers didn’t understand; that’s clearly not the case here.